Friday, June 1st saw the deployment of the Sansar Know Thy Neighbour release, which brings user profiles to Sansar, adds object interactions through scripts and something the Lab call Access to Controls. This article highlights some of the new features – and some deployed in May 2018. As always, full details of the updates in the new release are available in the release notes. Updates in this release mean that on logging-in for the first time following the update, users will be placed in the LookBook (Avatar App). Second Life users are more than familiar with the idea of user profiles and their usefulness. They are something that has been raised on numerous occasions as one of the missing elements within Sansar – and with this release, they’ve started to arrive. A Sansar profile can be used to display basic information about a user: their avatar name / ID, a photograph, and a short biography. In addition, viewing other people’s profiles allows users to request / remove friendship, see a summary of any store listings they have or experiences they have published, each of which are interactive. 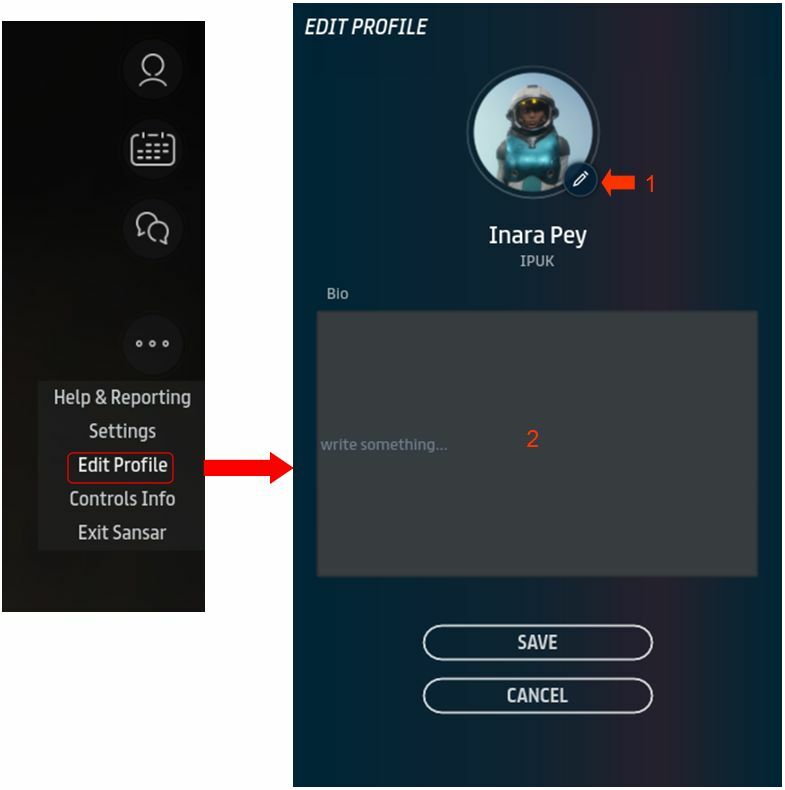 Every Sansar user has a profile by default, which can be edited and updated as required, although they must be updated from within the Sansar client. Profiles can, however, be viewed both within the client and on the web. To edit your profile, launch the Sansar client and then click on More Options > Edit Profile. This will open the Profile Editor, which has two user-definable fields: the profile image and biography. Profile images are automatically generated by Sansar, based on the looks you have saved in the LookBook (See Customising your avatar). To select / change your profile image click on the edit icon at the four o’clock position on the photo display (1 in the image below, right). A list of your available images will be displayed. Click on the one you wish to use with your profile. To update your biography, click on the Bio section (2 in the image below right) and enter your text. When you’ve completed your updates, click Save to apply them. From within an experience, through the client’s People App. Via the Atlas, either within the client or on the web. Via a store listing on the web. When in an experience, you can display someone’s profile by opening the Chat App then clicking on the People App button. To view the profile of someone on your Friends list, click on their name to display the interaction options and click Profile. 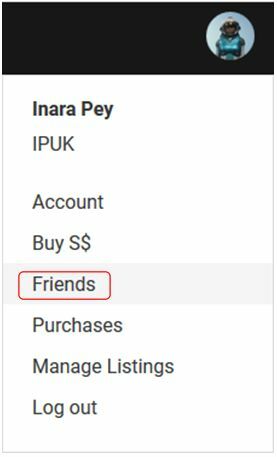 To view the profile of some on your Friends list, use the Search option, then click on their name to display the interaction options and click Profile. The user’s profile picture with a microphone icon at the four o’clock position. This is the mute / unmute option. Green indicates the person is not voice muted, red indicates they have been voice muted. Three central options to direct message them; to friend / unfriend them or abuse report them. The bottom section of a profile may – or may not – display one or other – or both – of two further options: Store Items and Experiences. Store Items: if the user has a Sansar Store, the total number of items they have listed will be displayed, with a See All option. Clicking the latter will display their store in your web browser. This option will be absent if the user does not have any items in the store. if the user has published one or more experiences, the total number of their published experiences is displayed, with thumbnails of each of them. A button (V or ^) is displayed in this section – if the user has more than one experience, this will switch the thumbnail view between a single experience thumbnail and a tiled display of thumbnails. This option will be absent if the user has not published any experiences. To close a displayed profile, click the Back button at the top left of the profile display. Note that when viewing a profile, you can also accept Friend requests sent by that person, as well as send your own. By hovering over their name in any of the Atlas thumbnail tiles. By opening the entry for an experience and hovering over the creator’s name. Note that web profiles will be more concise than those displayed in the client, featuring only their profile picture, their biography (if supplied), a friend / unfriend button and the number of experiences published / items they have listed on the Sansar Store (if any, in both cases). Profiles can be viewed from within the Sansar Store by selecting an item and then hovering over the name in the Sold By entry. It is now possible to review controls now within the client for both Desktop mode (keyboard and mouse) and VR mode (both Oculus and Vive). In Desktop Mode this is achieved via the More Options > Control Info option. The Know Thy Neighbour update includes a new web page listing all of your friends. To access it, click on your profile image at the top right of the most of the Sansar website pages (excluding Community and Help). This will display a list of options, including the new Friends option. Click this to display a list of all the friends you have made, with a button to Unfriend / Friend them. Clicking on a Friend’s name will display a summary page of the experience(s) they have created (if any) and their Sansar Store listings (if they have made any). Clicking the See All options alongside of the Experiences or Store Listings option to display a full list of their experience / list their Sansar Store. Object interaction through scripts: creators can now set objects in scenes to be clickable through scripts, paving way for desktop users to also interact with objects that require clicks. See Interactive objects in the Sansar knowledge base for more details. Performance improvements: additional steps have been added to make imported objects more efficient. Interaction – Adding a script with a public or [EditorVisible] Interaction property will make the object clickable and allow a prompt to be shown on hover. The Interaction can be enabled and disabled, and the prompt can be updated by the script. Advanced Script Feature: Coroutine handling – StartCoroutine now returns an ICoroutine interface that can be used to control coroutines and communicate between coroutines. Advanced Script Feature: Lock – For use with library style scripts that respond to calls from other scripts through Reflective. The Lock allows a script to declare a “critical section” that can only be accessed by 1 coroutine at a time. For more information, see Script API updates. This is not a part of the Know Thy Neighbour release, but was added in mid-May. If required, the user can then be banned from the experience, following the instructions in the article linked-to above. Profiles are something long requested, and while basic in format (at least at this point), the Know Thy Neighbour is a good start in delivering them. I did notice some inconsistencies when playing with them – hovering over a user’s name in the Atlas didn’t always result in a profile option being displayed. That said, this is a good starting step, and the Lab has indicated Sansar’s profiles will be enhanced over time.